We're almost at the end of the Back to Basics series, but not quite yet. This week, Ron of From the Warp and I are looking at metallic armour. Next week, we'll finish up with skin and hair. 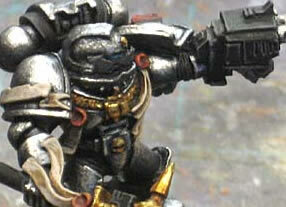 Take a look at Ron's post as he paints up a Grey Knight Marine. 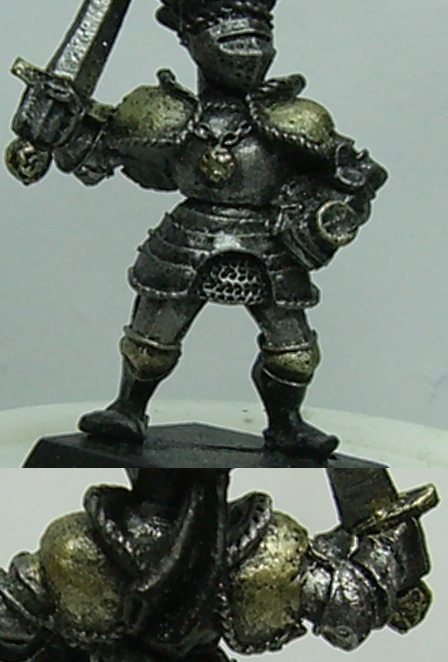 I usually prefer to start with a black base when I'm working with armour, that way it can be built up from the shadow and dark metallics to lighter colours and shine. 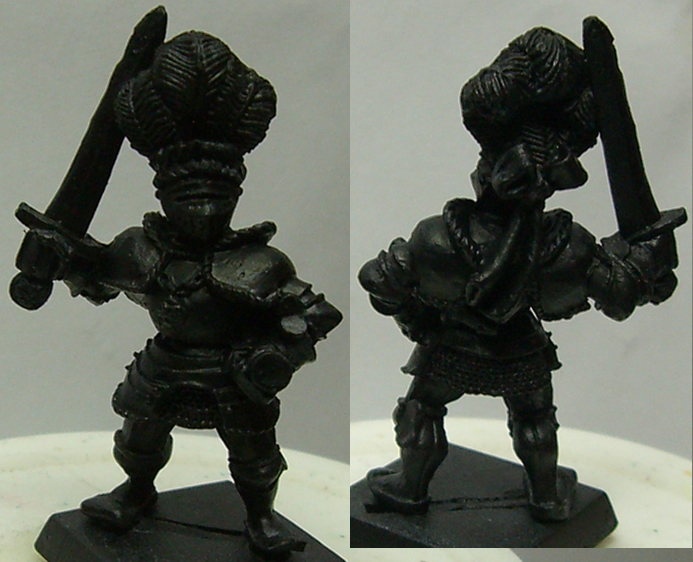 By basing the whole model the same way, the whole model will have a uniform look. 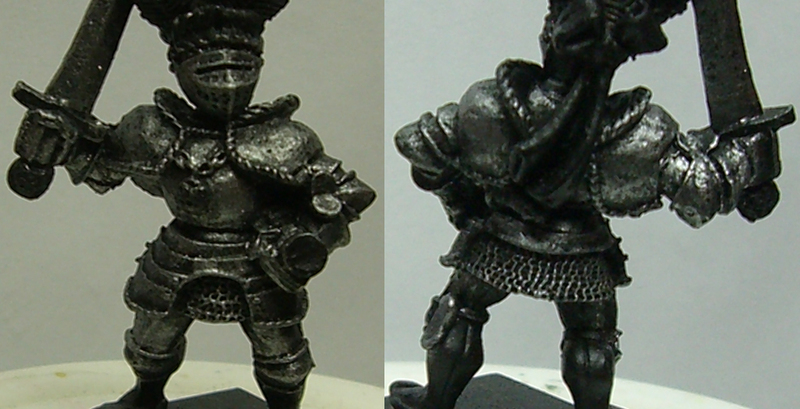 I'll be using one model to demonstrate a few different styles of painting armour. The focus here will be on dry-brushing, a great technique for new artists, and I suggest you familiarize yourself with it. I'll start with the super fun part - chainmail. I've loved painting chainmail from the moment I started painting, can't quite explain it. 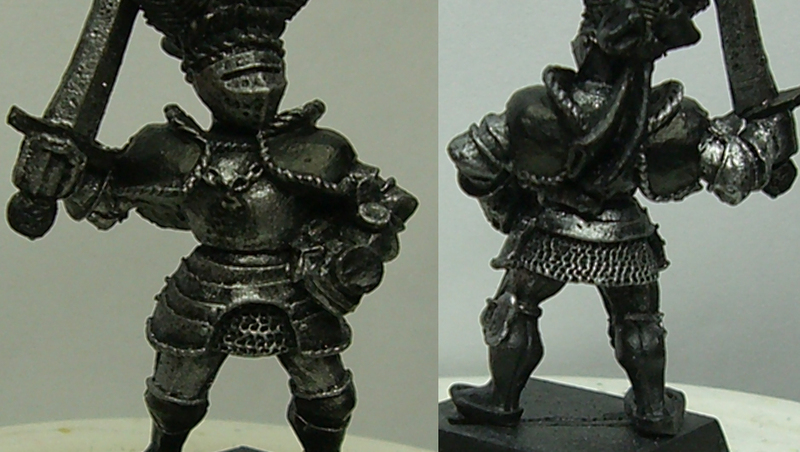 All I'm doing here is dry-brushing Mithril Silver over the black. Pictured is the progression as I layer the silver - notice I add more layers on the edge. This is just another step of dry-brushing. Here I've applied Boltgun Metal over all his plate armour and sword. Since dry-brushing is messy, especially when one of the first things you do to a model is dry-brush a large portion of it, I've painted his shoulders, knees, pendant and sword hilt black before I paint them gold. 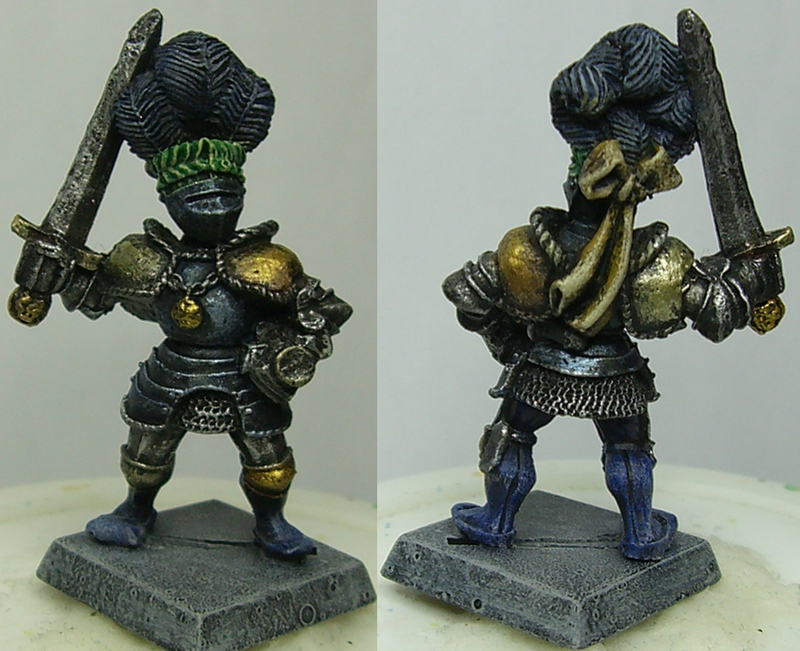 Next up I dry-brush Shining Gold on his shoulders, knees, pendant and sword hilt. During this step, you need a little more control because you don't want to get gold on the rest of his armour. If you do happen to paint outside the lines with the gold, it's not the end of the world - after all, we are talking about reflective metal, right? It'll just appear like a little shine. Not Pictured: (oops) I decided to paint half of his gold with Burnished Gold, you'll see in the next step. 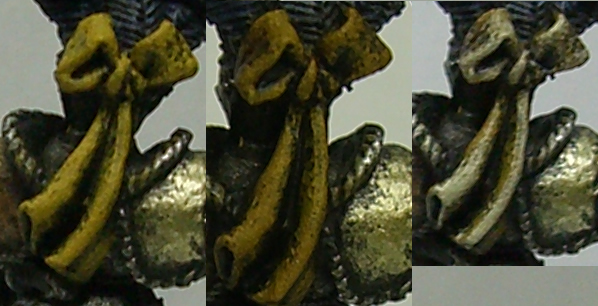 You can see here that I've painted half of his gold with Burnished and the other half Shining Gold. This step is an overall wash of Badab Black. (except on the chain) When working with dark or silver armour, blacks are a great wash. The Burnished Gold was washed with Ogryn Flesh, though other browns also work. Something you can mix in here is some colour to your washes - I'll show an example near the end of this tutorial. Blue works well with silver and red could work with gold. The final step for his armour is the highlight which, in this tutorial, means more dry-brushing. Mithril Silver will give a stronger highlight to the darkened Boltgun Metal, though if you wanted his armour darker, Boltgun would work. For the golds, I use the same gold to highlight as it's base. By now, you're probably seeing how useful dry-brushing can be. On this model in particular, you can also see how all details are brought out, especially when the model has lots of pits and rough sections. You can follow up the dry brushing by just painting highlight over these rough sections to clean areas up. 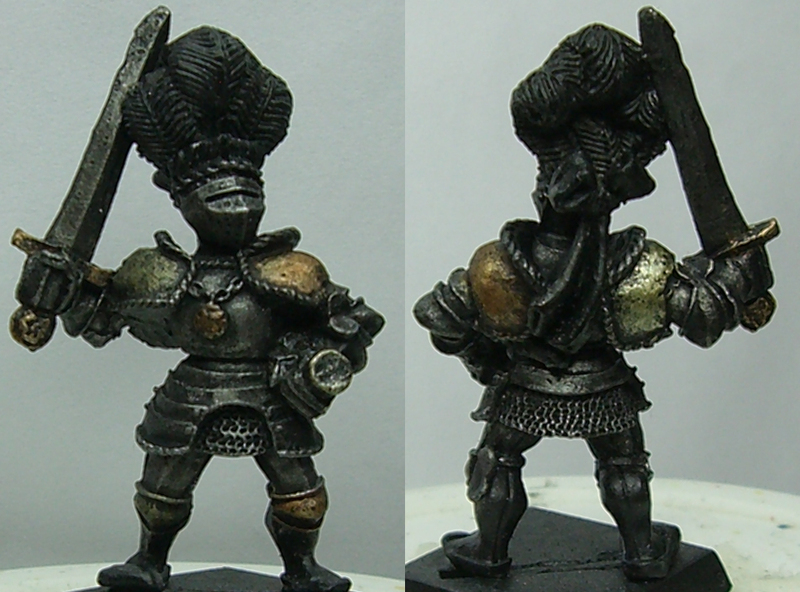 The two pictures here are just a close up example of what happens when you go crazy with dry-brushing and cleaning it up with black before continuing. I'm going to demonstrate in the following steps how when using three colours to paint something, doing something as simple as using a different middle colour can change the final product. A lot of colours to choose from when painting helps, but small changes can have an impact. I dry-brush his feathers and leggings with Necron Abyss and finish them with Fortress Grey. 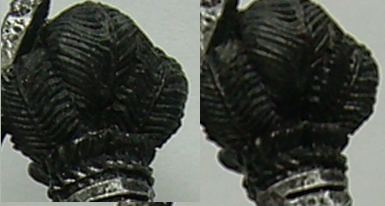 However, the feathers get a Mordian Blue dry-brush in the middle and the feathers are treated with Shadow Grey. His ribbon's painted with a simple Iyanden Darksun dry-brush, washed with Devlan Mud to blend the Darksun into the black base and finished with a Bleached Bone dry-brush. In retrospect, a very light dry-brush of a thin brown, tan or yellow would have been a nice cleansing final step. Another oops, sorry, I missed the middle photo here. The leaves around his head are a simple Goblin Green base, Thraka Green wash and Rotting Flesh dry-brush. As I mentioned above, other colours can be used to wash armour. 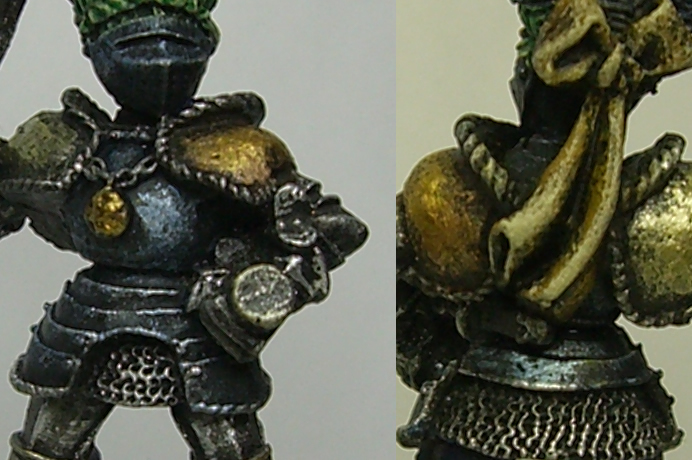 I decided to add a wash of Asurmen Blue to his chest and helm, which as you can see adds a cold metal look. A little silver or boltgun highlight to the edges gives a slightly different effect - look at his chest vs his torso plating, neither of which is wrong. You can also see better here that I've over-brushed some from the ribbon onto his shoulders. This also adds a little reflection. A Fortress Grey dry-brush to his base, which is naturally rough, adds a final stone look for something for him to stand on. So here's a model basically painted with nothing but dry-brushing. 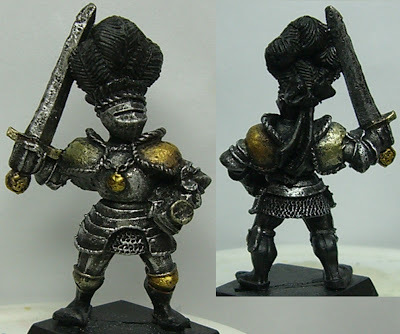 It won't work on all models, because most minis don't have room for that much black area to be left - I'm just getting away with it because of all his armour. A very simple model to paint, and very quick. (when you're not stopping to photograph every step) Remember that if some of these areas are a little rough for your liking, you can touch them up with your highlight colour or apply a heavy dry-brush - his sword might be the only place I'd touch up in the future. Now you've got a few different examples of how to paint armour, but don't forget to check out how Ron does it as well. Solid tutorial. As usual the step by step images are really well done and the accompanying explanation is both informative and enjoyable to read. The back to basics series goes from strength to strength! Good job. I really like this model. The hat kept me enthralled for a while- I kept wondering what you were going to do with it.